Nautical Decor - A Must For Your Coastal Rooms! Looking for that splash of the sea in your décor? Check out our nautical décor selection! We have a wide variety of fully assembled, high quality model ships and canoes, ship steering wheels, nautical book ends, anchors and rustic oars along with other unique nautical gems to bring the sea life into your home. Our nautical décor also works well with beach décor and tropical décor accents. Nautical Model Speedboat Proudly display this Fully ASSEMBLED nautical decor mode.. Awesome Sailboat NOT A MODEL SHIP KITAttach Sails and Bluenose model sail..
Bluenose II Sailboat Model This magnificent nautical decor sailboat model mak.. Authentic Yacht Replica For Your Nautical Décor Bristol Yach..
Superior Quality Speedboat- Nautical Décor Our Chris Craft Runabout Painted mode..
Superior Quality Speedboat- Nautical Décor This beautiful 100% handcrafted ..
Classic Nautical Rowing Boat Replica Add a touch of nautical decor to your ho..
Deluxe Class Wood and Brass Ship Wheel 30"
Wooden Ship's WheelThe Hampton Nautical Deluxe Class Wooden Ship's Wheel from Pacific Ho.. Magnificent Viking Replica Model Give your home or office a coastal touch by adding nau.. Magnificent Sailboat Model This magnificent nautical decor sailboat model makes a&..
Hawaiian Canoe Replica Model Add a touch of nautical decor to your home ..
Indian Girl Canoe Replica Model Add a touch of nautical decor to your ho..
Nautical Sailboat Replica The Pen Duick was one of the most b..
Small Nautical Sailboat The Pen Duick was one of the most beautiful..
Peterborough Canoe Replica Model Add a touch of nautical decor to your h.. 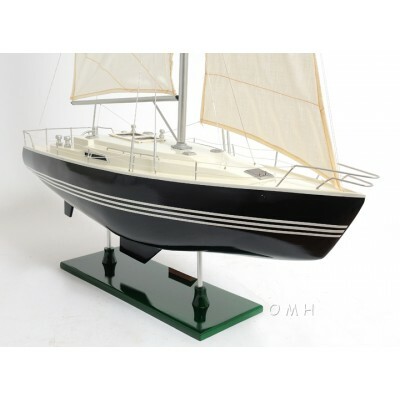 Victory Yacht Model Ship Our Victory Yacht model ship is handcrafted from be.. Wooden Newport Rowing Oar 62"
Nautical Wooden Rowing Oar!This Wooden Newport Rowing Oar 62" from Pacific Home Furniture o.. Wooden Rustic Blue Anchor w/ Hook Rope and Shells 24"
Wooden Nautical Blue Anchor Pacific Home Furniture offers an icon of sailing past.. Wooden Rustic Blue Lake Decorative Squared Rowing Boat Oar 62"
Wooden Rustic Blue Lake Decorative Squared Rowing Boat Oar 62"! This Wo.. Wooden Rustic Blue/White Anchor w/ Hook Rope and Shells 24"
Nautical Blue/White Anchor w/ Hook An icon of sailing past and present, the nautical an.. Wooden Rustic King Squared Rowing Oar 50"
Rustic Wooden Rowing Oar 50"-Pacific Home Furniture’s Wooden Rustic King Harbor Rowin.. Wooden Rustic Red Anchor w/ Hook Rope and Shells 24"
Nautical Decor- Wooden Red Anchor w/ Hook....Pacific Home Furniture offers an icon of sailing pa.. Wooden Rustic Red/White Anchor w/ Hook Rope and Shells 24"
Nautical Wall Decor-Red/White Anchor w/ Hook....An icon of sailing past and present, the nautica.. Wooden Rustic Whitewashed Anchor 13"
An icon of sailing past and present, the nautical anchor is both a necessary p.. Wooden Rustic Whitewashed Marblehead Squared Oar 62"
Rustic Whitewashed Marblehead Squared Oar!Pacific Home Furniture’s Wooden Rustic Whit..
Ship Wheel 36"The Hampton Nautical Deluxe Class Wooden Ship's Wheel from Pacific Home F..